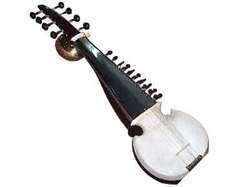 We are offering our clients Dilruba Instrument. This is made with tun wood and on this instrument, celluloid engraving work is done. Available with bow, mathis and head fittings, this instrument deliver melodious tone.We are majorly looking for foreign queries. Our company has been acknowledged in offering Saxophone Reeds. We have carved a niche amongst the most trusted names in this business, engaged in offering comprehensive range of Ethnic Sitar.